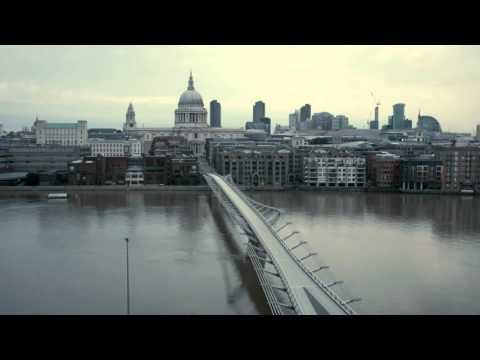 I think I first saw the Millennium Bridge in an episode of Black Mirror, the British sci-fi series you can catch on Netflix. It’s a dramatic looking structure, especially when it’s empty. At the end of the very first episode of the first season (titled National Anthem) the solitary figure of the kidnapped princess, a beloved Royal, is seen wobbling back across the empty bridge. The show was great but it’s the suspension bridge created expressly for pedestrians, with the dome of St. Paul’s Cathedral in the background, that caught my eye and captured my imagination. The bridge has caught a lot of imaginations. I’ve since learned the bridge was also seen in the 6th installment of Harry Potter and the Deathly Hallows: Part Two. In the film, the bridge collapses after an attack from the Death Eaters. 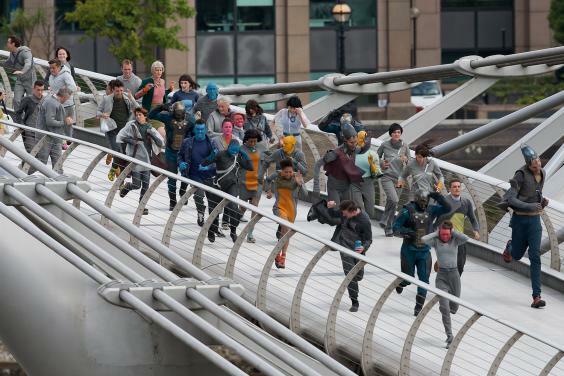 The Millennium bridge was also featured in a battle scene in Guardians of the Galaxy. Plenty of reasons for movie fans to visit and I’m excited too. Last week after we finished up our walk at the Tate Modern, seeing the bridge crossing the Thames, the cathedral in the background, I looked forward to crossing it even as humble armchair traveler. Now I’m beside myself because after an almost 30 year absence, I am going home to England in May! My husband and I have been married 25 years in October; we’ve decided that treating ourselves to a long talked-about trip is the best way to mark the occasion. I’ll be able to visit in real time many of the attractions I’ve been writing about over the past 60-odd weeks. Those three little overused words—I. Can't. Wait. —never seemed more apt. I’m grateful that the bridge—which was a bit wobbly when it opened in 2000—was quickly closed and the wobble removed! It took two years to do the retrofit but the bridge re-opened in 2002 and can now hold up to 5000 people at a time, wobble-free. After we depart the bridge, having taken lots of pictures of my own!—I can’t wait to share on Instagram—we’ll see what’s on the other side. 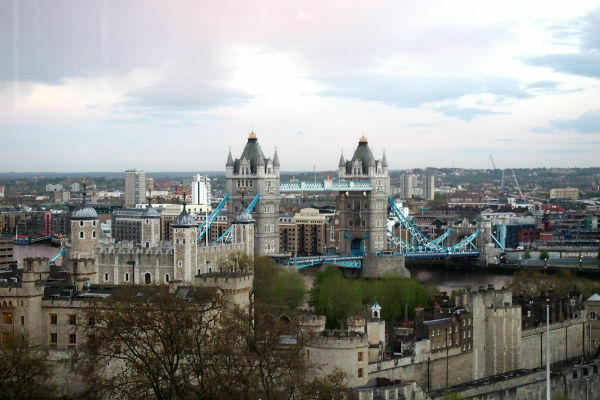 I’ve already been to St. Paul’s Cathedral (on Day 51 of this fantasy journey and as a young woman in the 70’s) so while you’ll of course want to visit, today we’ll take a turn along the District Line route toward Tower Bridge. 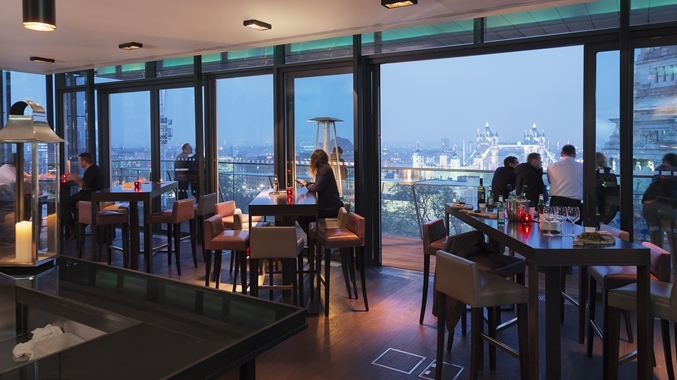 Passing the Monument to the Great Fire of London, climbing Tower Hill we’ll head to the SkyLounge, a rooftop bar & restaurant atop the Hilton DoubleTree Hotel overlooking Tower Bridge and the Tower of London. It’s a beautiful spot—much more than a room with a view—offering brunch, lunch dinner and cocktails. I’ve got my eye on a Royal Mojito “the king of all mojitos served with real champagne. Chairman’s Reserve, mint and lime. Topped up with Lanson Pere et Fils Champagne.’’ Worth the £13.50? How could it not be? I’m really looking forward to sharing my own pictures of this knockout place to relax, recuperate and review our next move on our walk Above Ground on the London Underground. Woohoo! That is so exciting that you're going to get to go to England so soon. I can't wait to enjoy your trip vicariously -- including a walk across the Millennium Bridge.